Blast off with Redstone™ 240Z Wash. It features a 14:1 optical zoom system (5°-70°range) and is fitted with a high-output OSRAM 240W 4-in-1 LED (RGBW). The wash applies light pipe technology with a textured Fresnel lens to deliver perfect, pure and even color mixing with endless options. It also provides a specially designed rotating prism to create fantastic beam shaping effects. The fixture has 5 dimming modes and 4 dimming curves. It provides variable speed shutter/strobe effect, internal programs and a variety of pre-programmed macro effects for easy operation. It offers ultra fast and smooth pan/tilt movements, plus simple and complex DMX channel profiles. 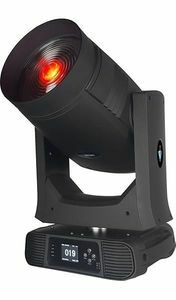 RDM, Art-Net, are also supported, and it has a built-in Wireless Solution wireless DMX receiver.